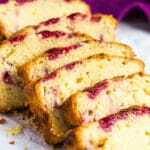 Raspberry Swirl Lemon Pound Cake – Incredibly moist and fluffy lemon-infused pound cake swirled with a fresh raspberry sauce! If you loved my Perfect Pound Cake recipe, then you’ll love today’s recipe. 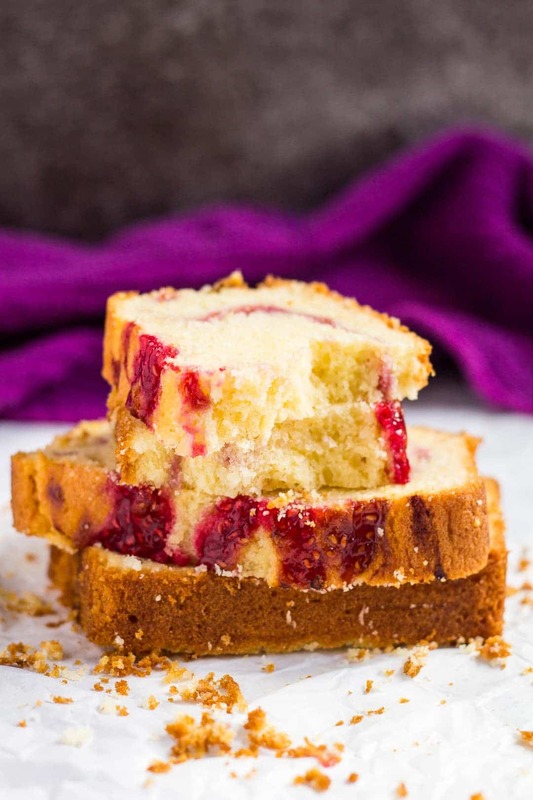 Today, I bring you my Raspberry Swirl Lemon Pound Cake! 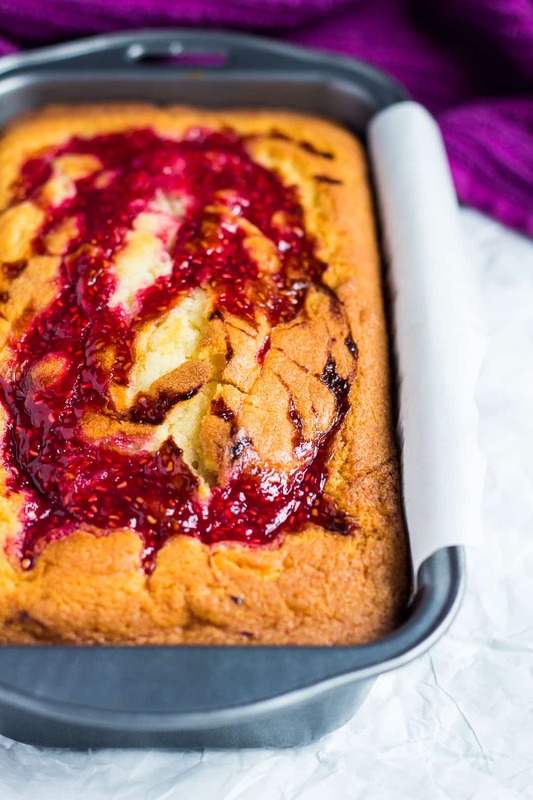 It’s my Perfect Pound Cake, only it’s infused with lemon, and swirled with a fresh raspberry sauce. 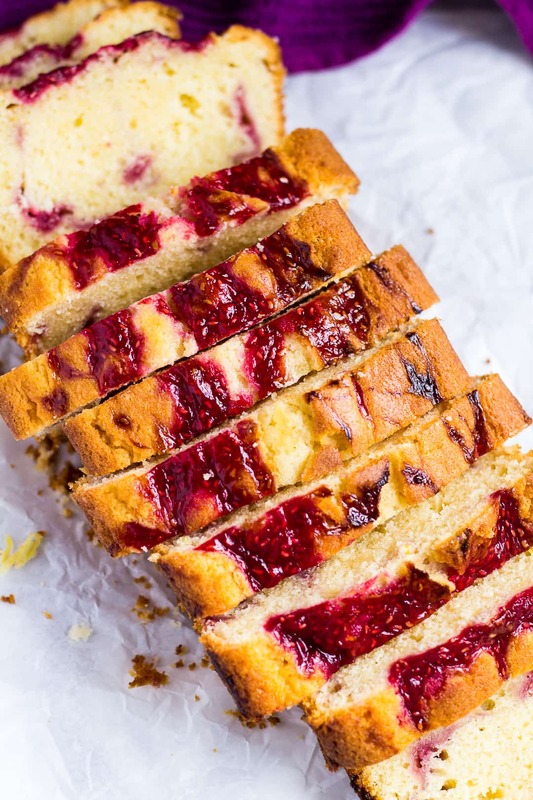 Pound cake just got a summer makeover! 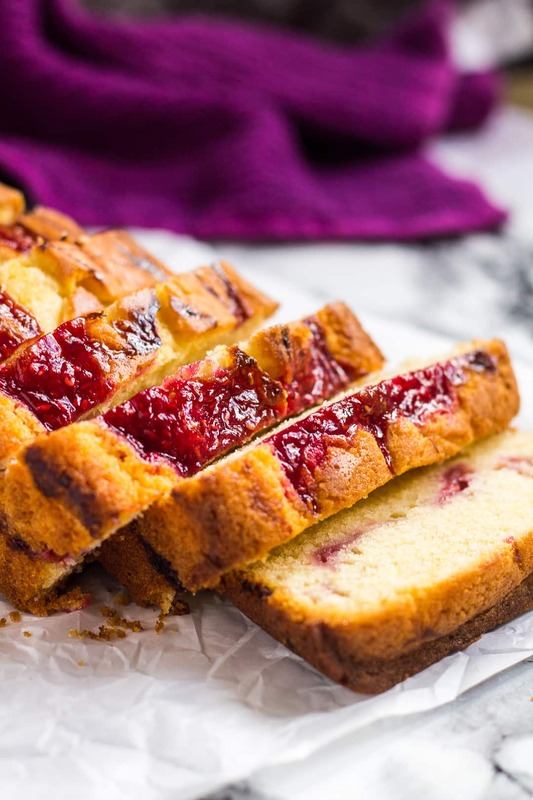 To make this pound cake, simply start by making the raspberry sauce. Place the raspberries and sugar into a saucepan over medium heat, and bring to the boil. Cook for about 5 – 10 minutes, stirring frequently, until the raspberries have broken down, and the mixture has thickened slightly. For the cake, whisk together the flour, baking powder, and salt. Set aside. In a separate bowl, beat the butter until light and fluffy, then add the sugar and beat until combined. Mix in the eggs, one at a time, then mix in the yogurt, lemon extract, and zest. Gradually mix in the dry ingredients until combined. 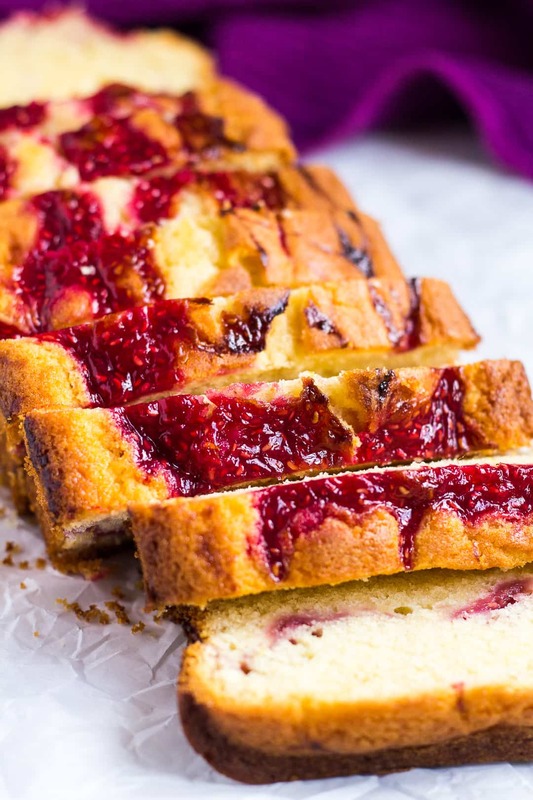 Pour half of the batter into a greased 9×5-inch loaf pan lined with parchment paper, spread out, and drop spoonfuls of the raspberry sauce on top. Use a toothpick or knife to swirl the two mixtures together. Pour the remaining batter in the pan, spread out, then top with the remaining raspberry sauce, creating swirls. Bake for 50 – 60 minutes, or until a toothpick inserted into the centre of the cake comes out clean. Leave to cool completely in the pan on a wire rack before slicing and serving. How long will this pound cake last? This cake can be stored in an airtight container at room temperature or in the fridge for up to 5 days. Can I freeze this pound cake? Yes, it also freezes well for up to 3 months. Thaw overnight in the fridge before serving. Allow to come to room temperature if desired. Try these delicious cakes next! 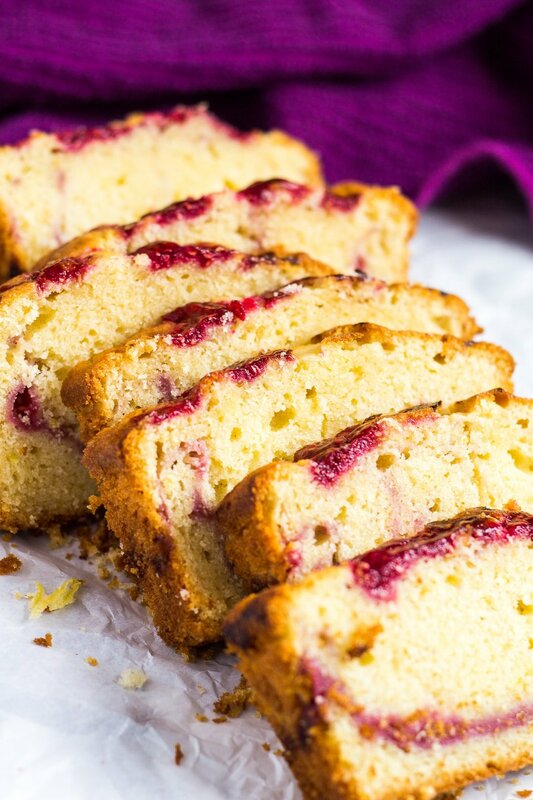 Incredibly moist and fluffy lemon-infused pound cake swirled with a fresh raspberry sauce! Place the raspberries and sugar into a saucepan over medium heat, and bring to the boil. Cook for about 5 - 10 minutes, stirring frequently, until the raspberries have broken down, and the mixture has thickened slightly. Allow to cool completely. Preheat the oven to 180C/350F/Gas 4. Grease a 9x5-inch loaf pan and line with parchment paper. Set aside. Using a handheld or stand mixer fitted with the paddle attachment, beat the butter until light and fluffy. Add the sugar and beat until combined. Mix in the eggs, one at a time, beating well after each addition. Mix in the yogurt, lemon extract, and zest, then gradually mix in the dry ingredients until combined. Pour half of the batter into the prepared pan, spread out, and drop spoonfuls of the raspberry sauce on top. Using a toothpick or knife, swirl the two mixtures together. Pour the remaining batter in the pan, spread out, then top with the rest of the raspberry sauce, creating swirls. Bake for 50 - 60 minutes, or until a toothpick inserted into the centre comes out clean. Cover loosely with aluminium foil halfway through baking to prevent the cake from browning too much. Leave to cool completely in the pan before slicing and serving. Leftover cake can be stored at room temperature or in the fridge for up to 5 days. This cake also freezes well for up to 3 months. Thaw overnight in the fridge before serving. *For seedless raspberry sauce, puree 2 cups (250g) of fresh raspberries until smooth. Push the mixture through a sieve into a saucepan. Discard the seeds. Add 4 tablespoons of caster/granulated sugar, and bring to the boil over medium heat. Cook on medium-low heat, stirring frequently, for about 10 minutes until the sauce has thickened. Allow to cool completely. This pound cake looks superb!! I love the raspberry and lemon combo. This cakes looks like a cake I would still over at a bakery when I just walked in to by coffee . Love the combo! This is my favorite kind of cake, Marsha! An awesome summer dish! Would you recommend it with a cup of tea?